Easy Gourmet Recipes - Chocolate Chip Cookies Recipe. Healthy natural recipes including breakfast recipes, appetizer recipes, soup recipes, pasta recipes, holiday recipes, party recipes, dessert recipes, gluten-free recipes, raw recipes and budget recipes. Easy to make; delightful to eat! These chocolate chip cookies are a super yummy treat for picnics, parties and everyday life. 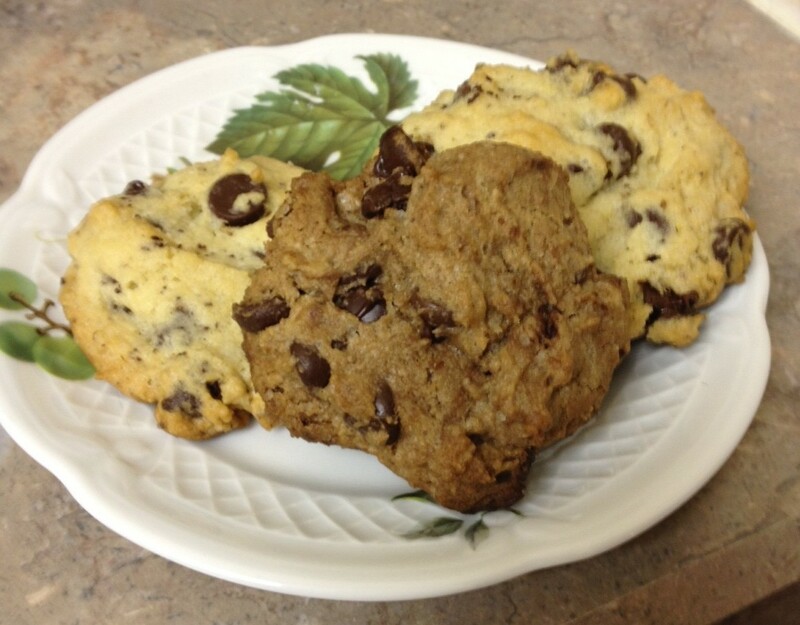 You can make “chocolate chocolate-chip cookies” as a variation by separating the dough into two parts and adding raw cacao powder to one half of the dough. Note: You'll need two non-stick baking sheets and a wire rack for cooling the cookies. 1. Pre-heat oven to 375 degrees F. Mix soy milk, flax seed, and vinegar together in a small bowl. The mixture will thicken. Set aside. 2. Sift flour, baking soda, and salt together into a medium bowl. 3. In a large bowl or mixer, cream sugar and Earth Balance until fluffy. Mix in vanilla. Add the soy milk mixture from the small bowl. Mix thoroughly. 4. Add the flour mixture to the ingredients in the large bowl, mixing well. (If making chocolate chocolate chip cookies, separate one half of the dough and add cacao powder. )Mix in vegan chocolate chips. You will have a soft dough. 5. Fill the baking sheets with heaping tablespoons of the dough about 1 inch apart. Bake for 10-14 minutes. 6. When the cookies are golden on top and lightly browned on the bottom, remove them from the oven. Let them sit 2-3 minutes on the cookie sheet and then transfer them to a cooling rack to cool completely. Copyright 2019 Montara Media, All Rights Reserved.